Stealth Elf is a very strong and very brave elven ninja. She is a playable character in Skylanders: Spyro’s Adventure, and is very talented with the element of life. As to be expected from an elf, she really enjoys and appreciates nature. Some have even rumored that she has the reputation of being a guardian of the forests in Skylands. Stealth Elf was separated from her parents when she was very young. She doesn’t remember much about her parents or where she came from, but she does remember waking up among the trees in the forest. It was there that she met a tree-like creature who was a master of stealth. This creature took Stealth Elf in and trained her to become a great stealth fighter. She soon became much more talented than her teacher, though, so Master Eon was called to investigate. Upon his arrival, he was immediately impressed and asked Stealth Elf to join the Skylanders team. She accepted, and is using this opportunity to protect the Skylands from evil doers, but to also try and uncover the mysteries of her past. She has a legendary counterpart known as Legendary Stealth Elf, who is exclusive to Toys ‘R’ Us stores. Also, Ninja Stealth Elf is her series 3 counterpart. As a small child, Stealth Elf awoke one morning inside the hollow of an old tree with no memory of how she got there. She was taken in by an unusually stealthy, ninja-like tree creature in the deep forest. Under his tutelage, she has spent the majority of her life training in the art of stealth fighting. After completing her training, Stealth Elf became a Skylander, putting her skills in good use while also trying to uncover the mystery behind her origins. Back and better than ever, Series 2 Skylanders Giants are returning from Skylanders Spyro's Adventure with new "Wow Pow" power upgrades and increased level cap "Silent but deadly!" says Stealth Elf. For generations, the Skylanders have used their magical powers and weapons to protect Skylands. But now, an evil tyrant has frozen them and banished them to Earth. Only you can put them on the Portal of Power and bring them to life to save Skylands once again. 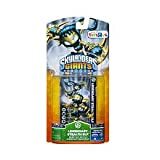 Collect and build the ultimate army of Skylanders Giants! Each Skylander Giant has their own unique powers and abilities to enhance your game play experience and save Skylands again. Bring your Skylanders Giants to life by placing them on the Portal of Power! As a small child, Stealth Elf awoke one morning inside the hollow of an old tree with no memory of how she got there. She was taken in by an unusually stealthy, ninja-like forest creature in the deep forest. Under his tutelage, she has spent the majority of her life training in the art of stealth fighting. After completing her training, she became a Skylander and set out into the world to uncover the mystery behind her origins. See Stealth Elf in Action!